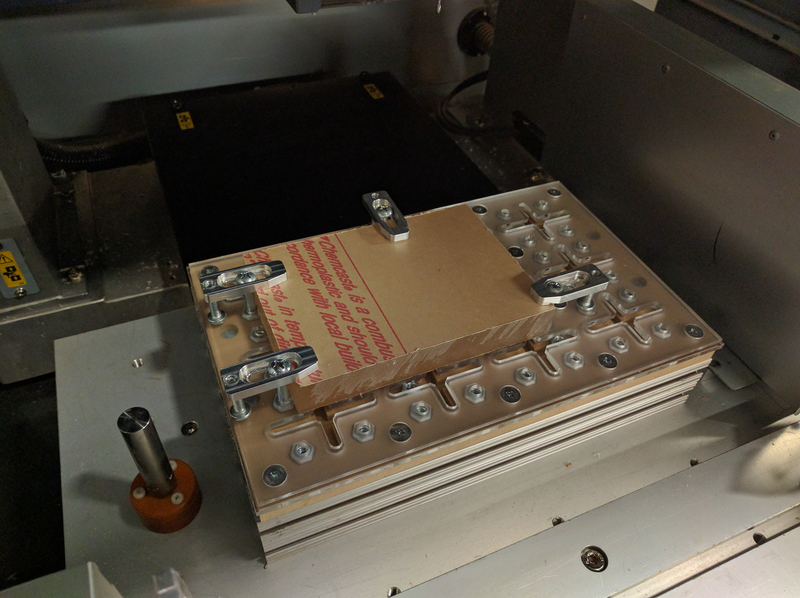 One of the issues with the Roland MDX-540 is that it’s surprisingly difficult to mount stock for milling when not using the vise in the rotary unit. 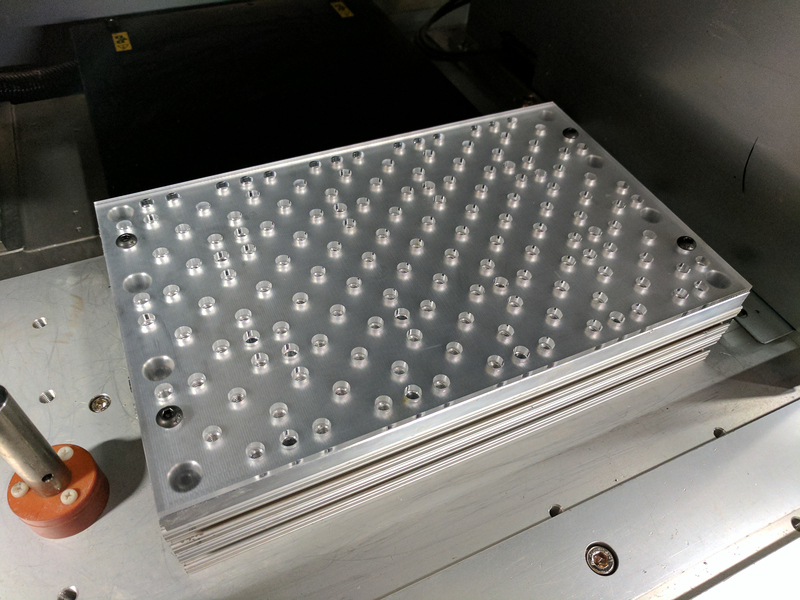 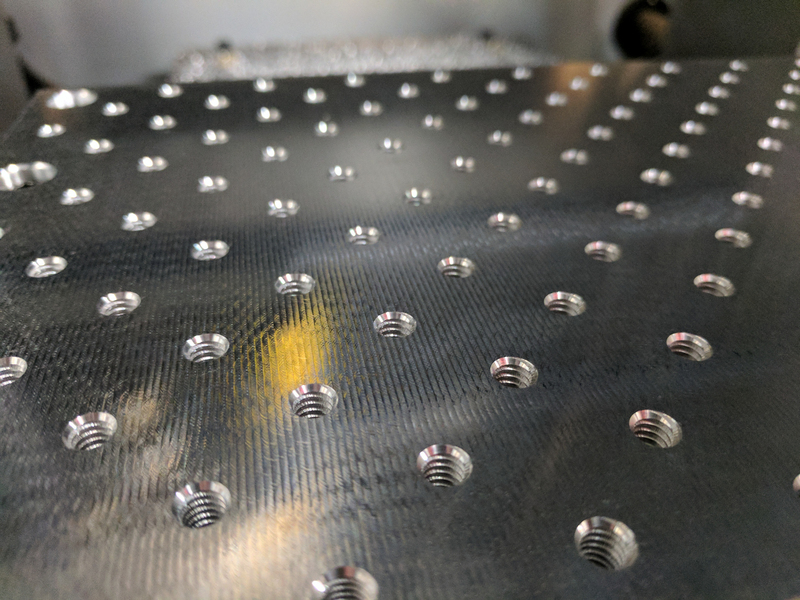 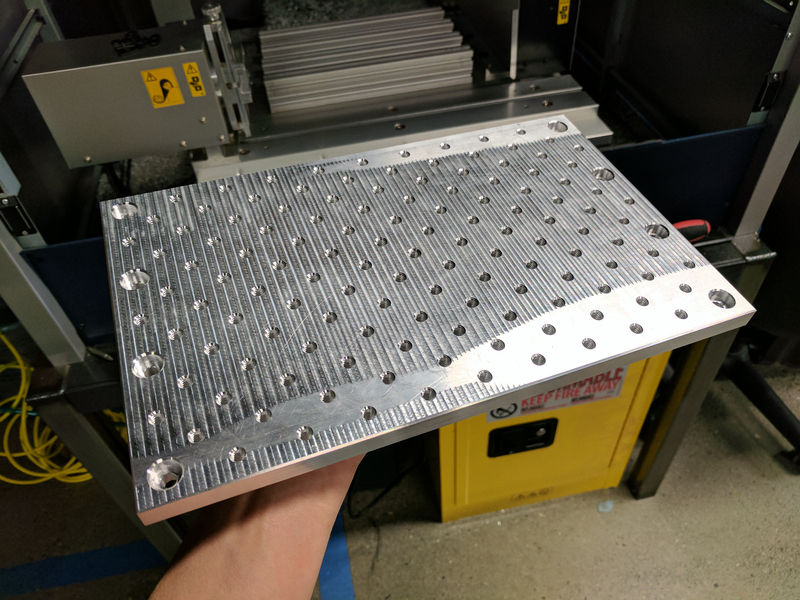 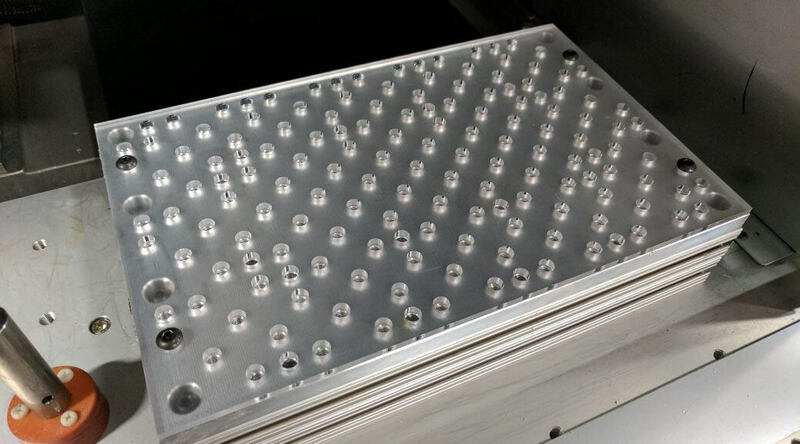 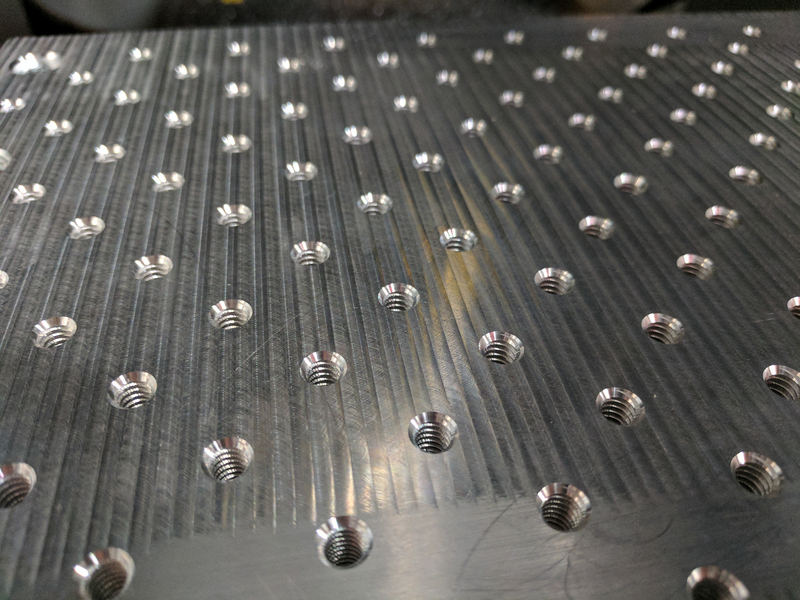 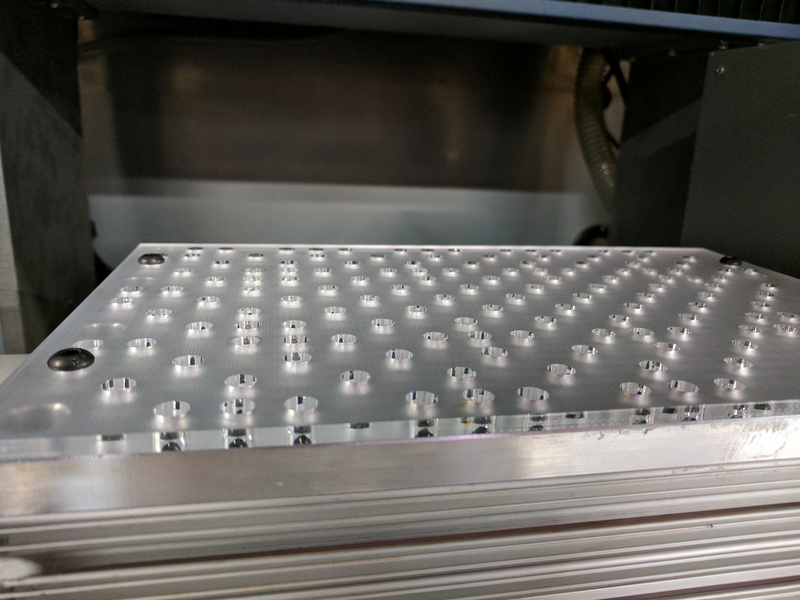 The old fixturing table consisted of an MDF sheet with a few holes drilled in it to allow it to be attached to the aluminum extrusions. 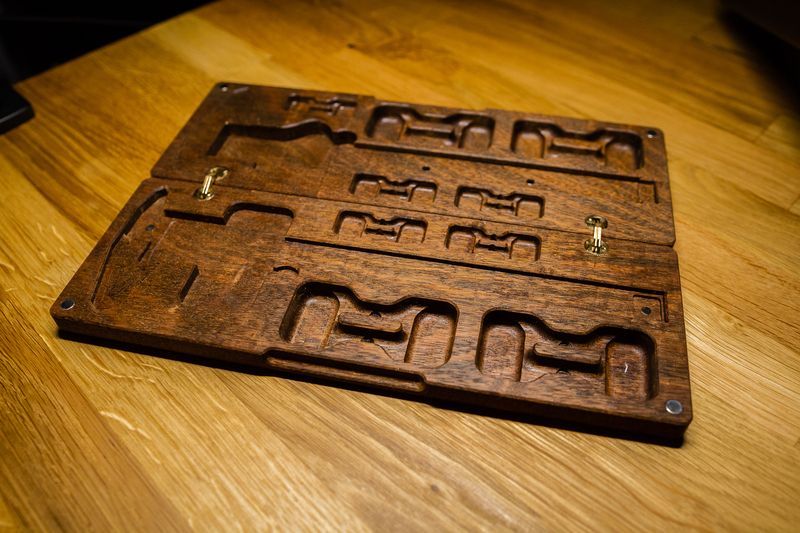 Removal of the table was required to mount anything, so it was nearly impossible to mount stock with any sort of accuracy onto the table. 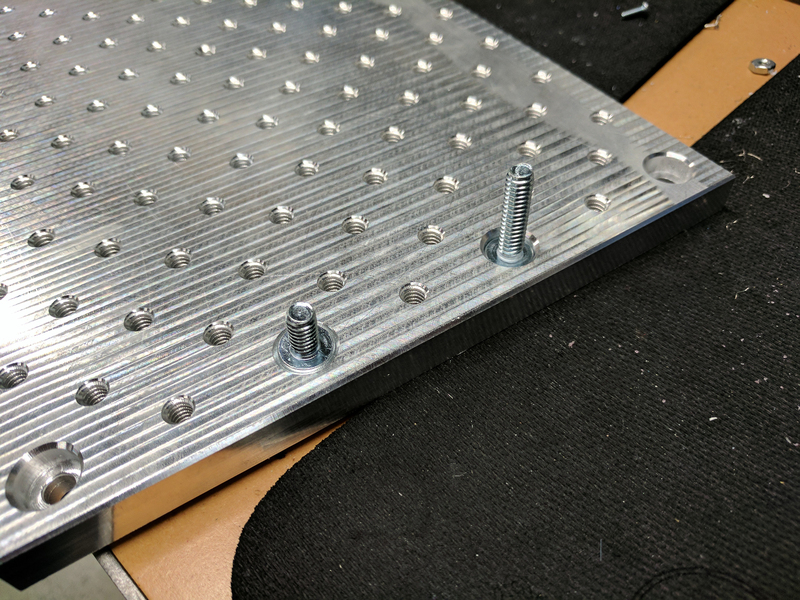 My fix for this was to redesign and remake the fixturing table out of aluminum together with some custom clamps and alignment blocks to allow for the precise positioning of stock onto the table. 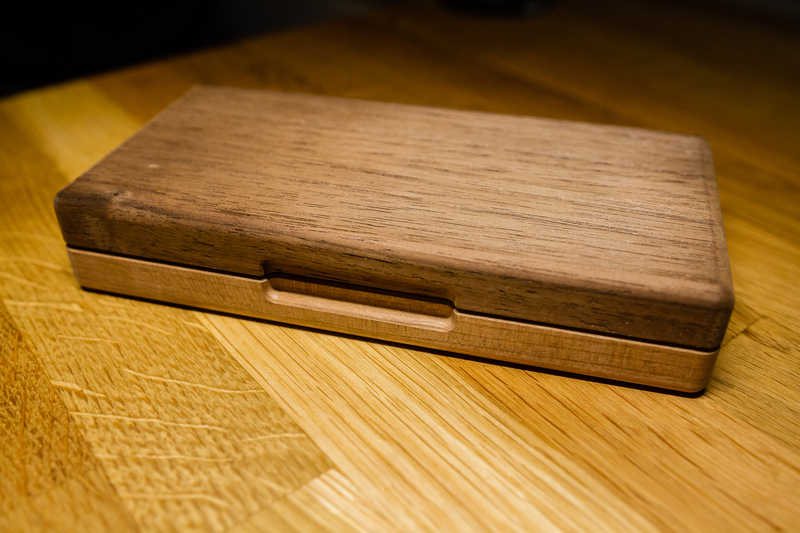 Here’s another small project I did a while back. 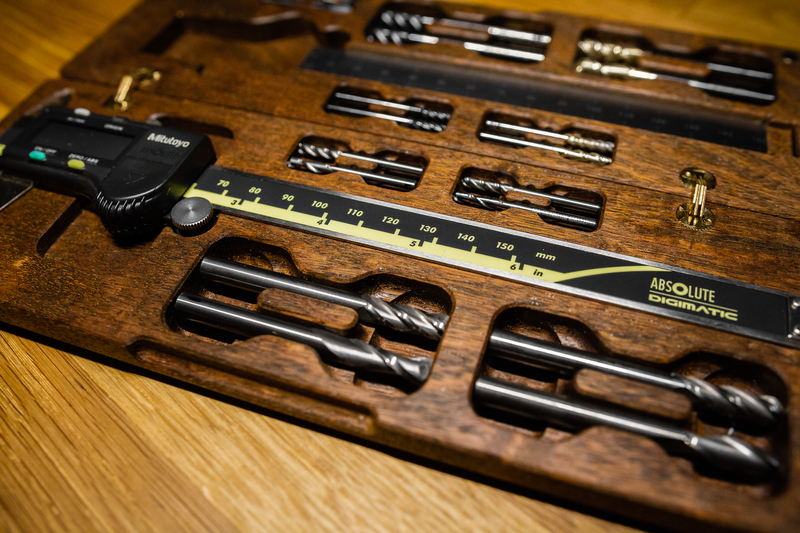 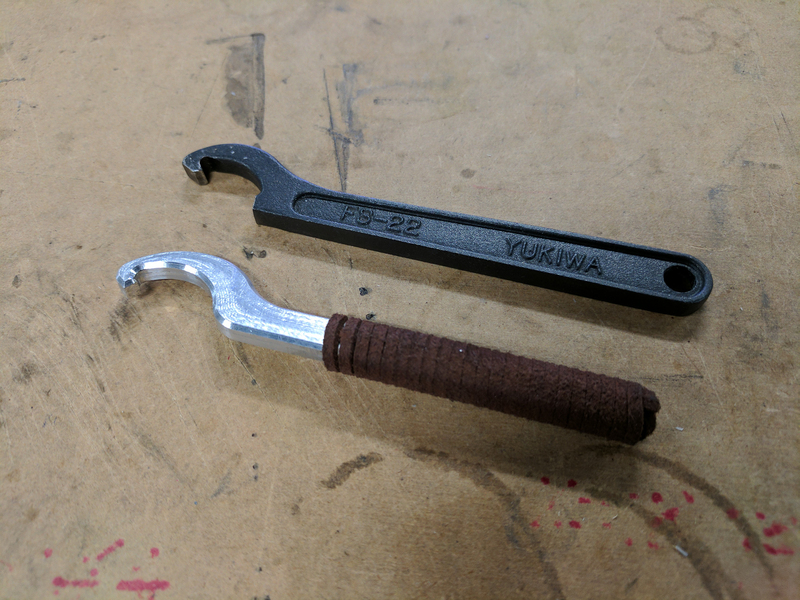 The chuck spanner for the Roland MDX-540 in the Garage went missing, and without it the entire machine was out of commission as there was no way of tightening the lock nuts on the tool holders for the end mills. 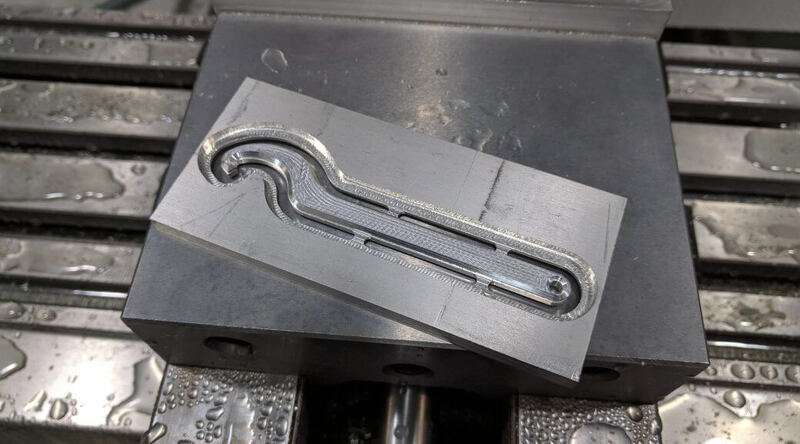 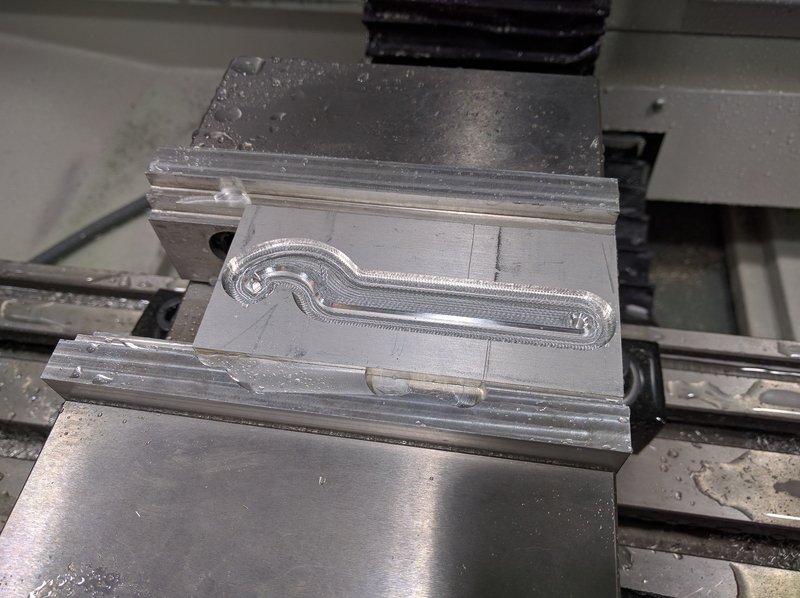 Rather than order and wait for a replacement spanner, I decided to model up and mill out a replacement on a Tormach PCNC 770. 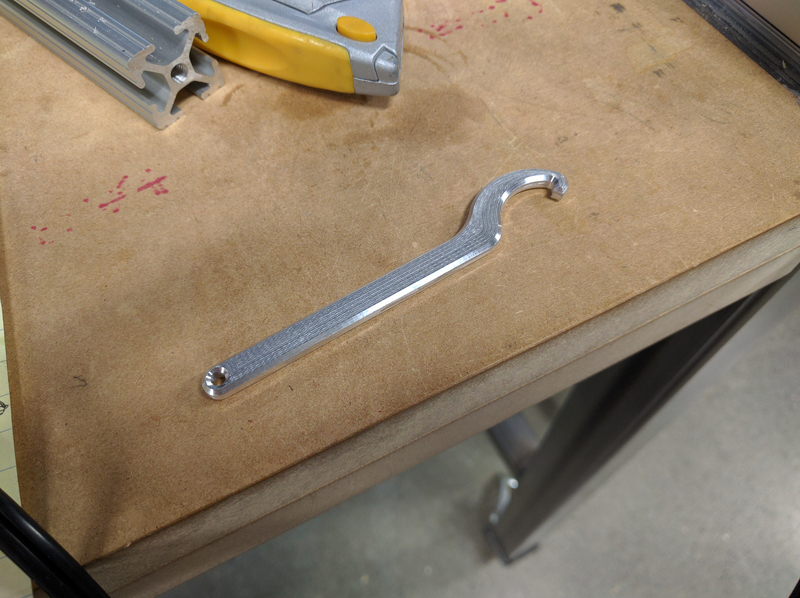 Results were great, but I did hit some alignment issues on the Y-axis which resulted in a small ridge running along the side of spanner. 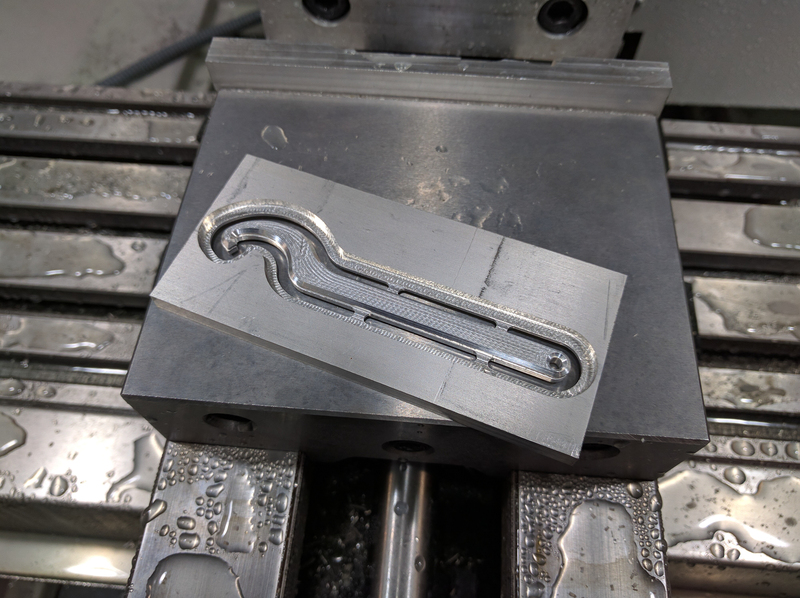 Lesson learned: check both the Y-origin as well as the X-origin after flipping the stock in the vise, the Y-axis origin may vary by up to a few thousands of an inch. 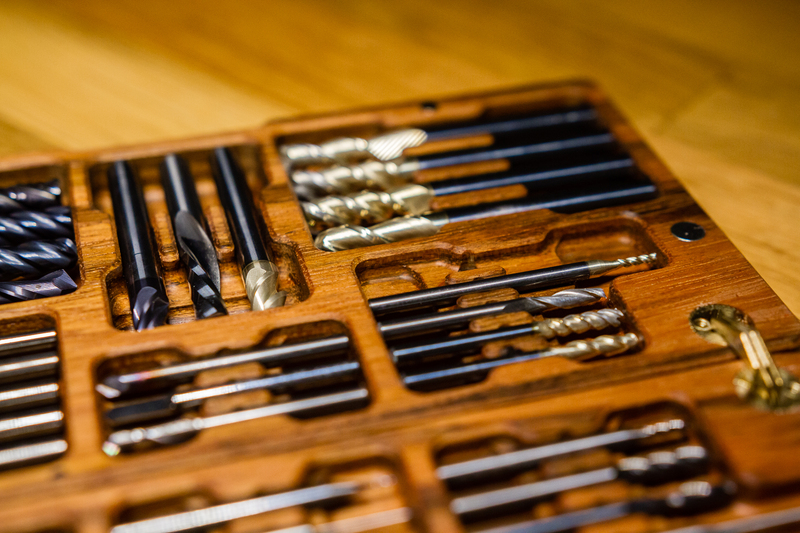 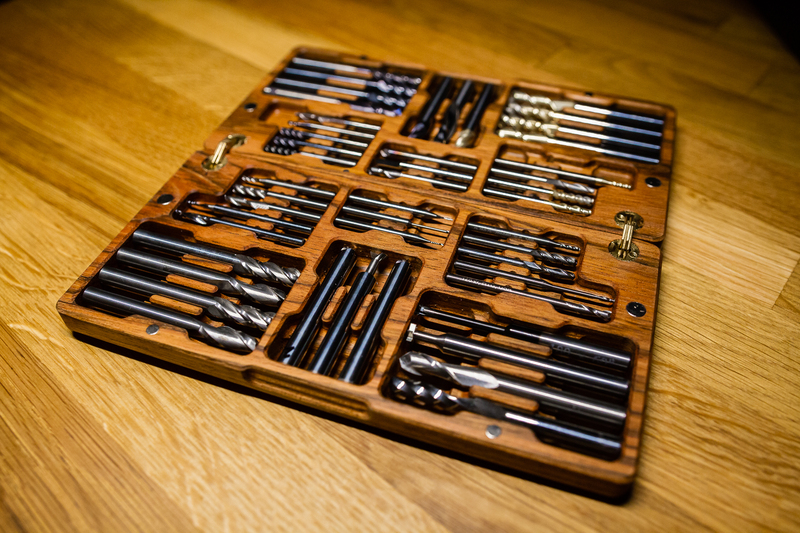 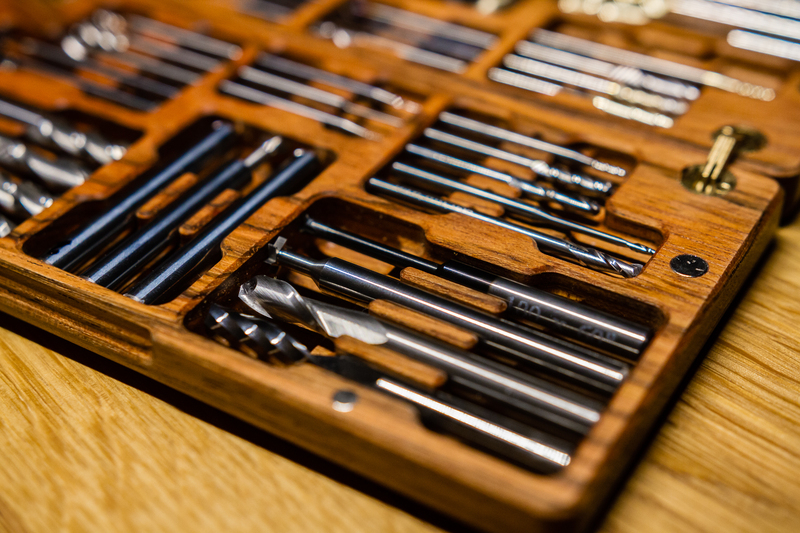 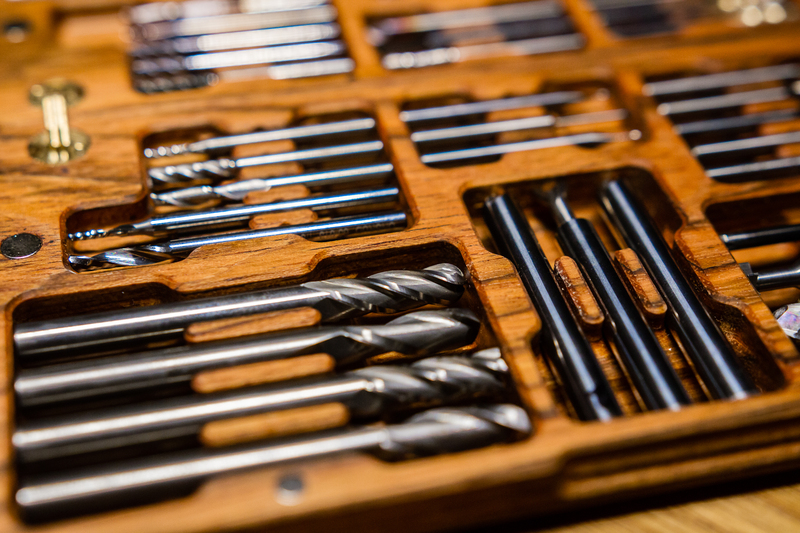 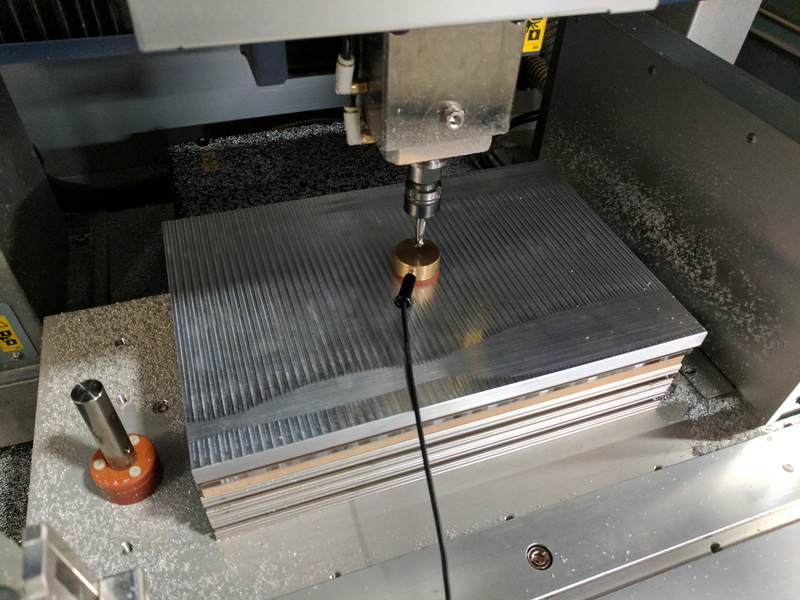 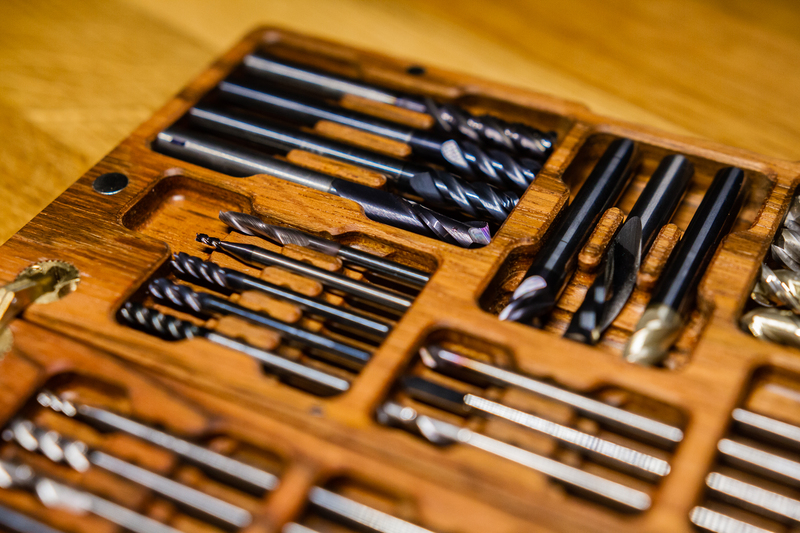 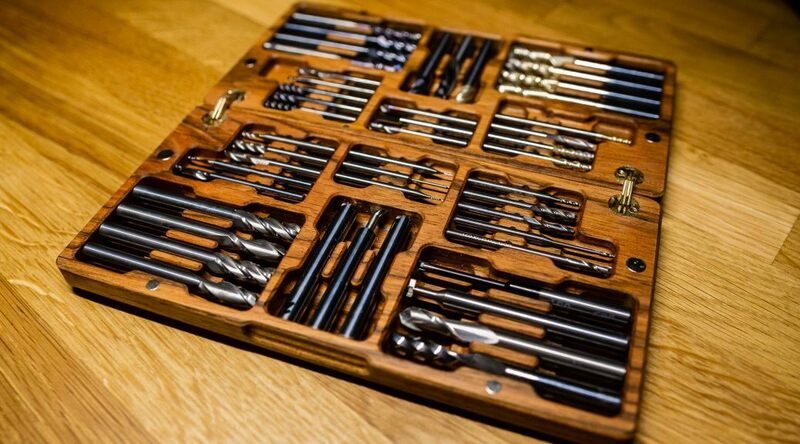 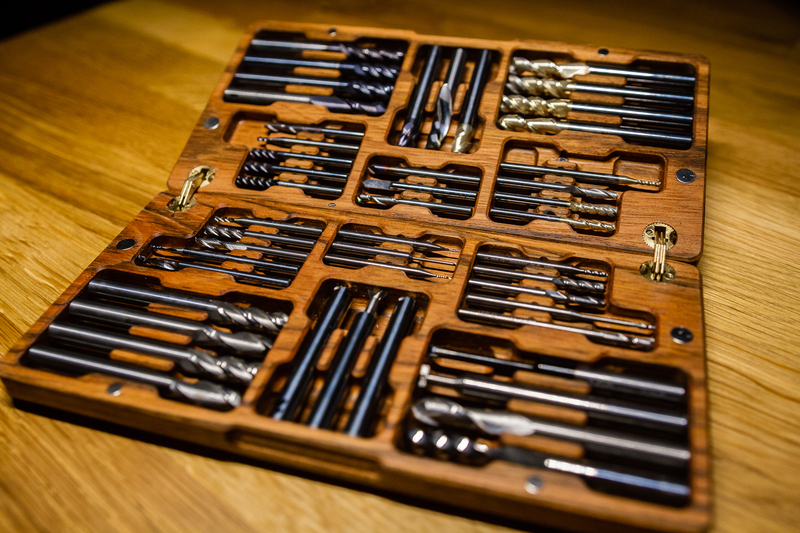 One of the downsides of working with a large variety of materials (wood, plastics, aluminum, steel) in CNC mills is that each material requires a set of end mills tailored for that material. 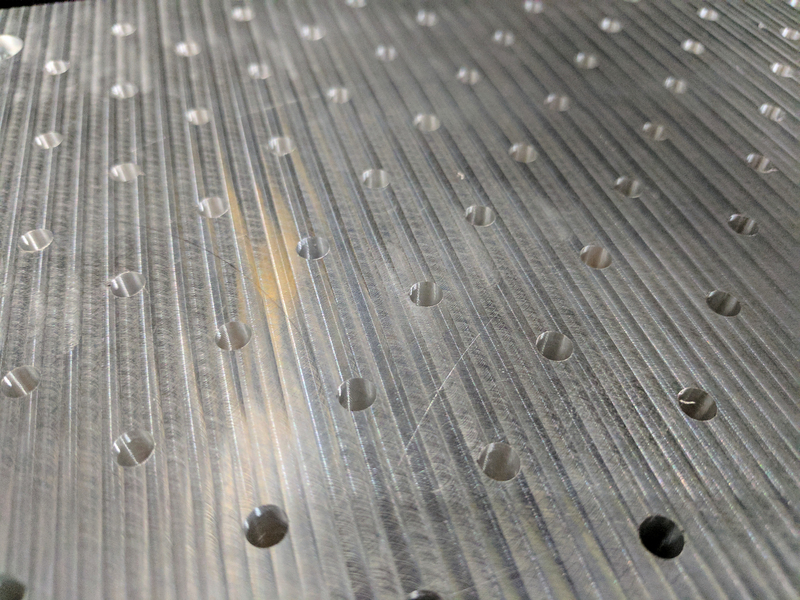 The basic requirement for each material is a square (flat) and ball (round) mill, but on top of that you have roughing (1-2 flutes) vs finishing (4+ flutes) mills, different sizes (1/2″, 1/4″, 1/8″, 1/16″, and 1/32″), and a number of specialty end mills (chamfer, dovetail, keyway, drills, threading, and engraving). 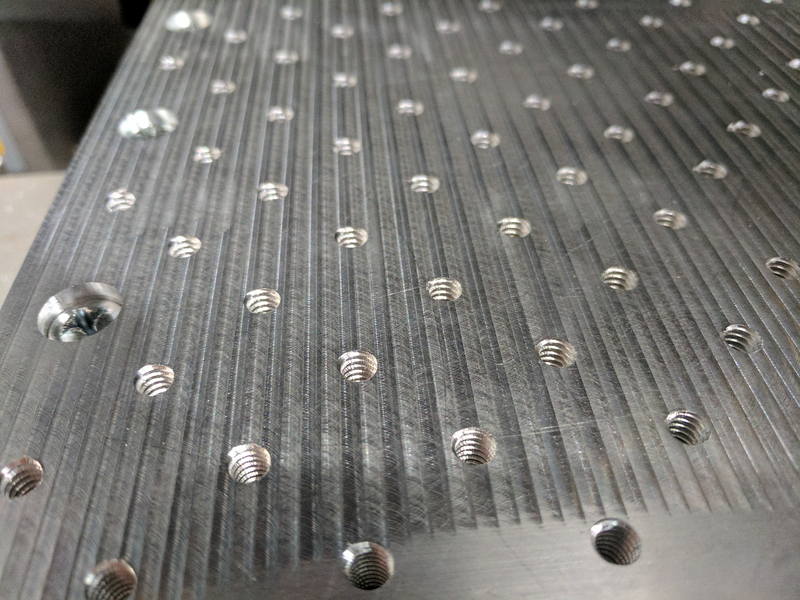 All together, that’s a significant number of end mills to have to carry around. 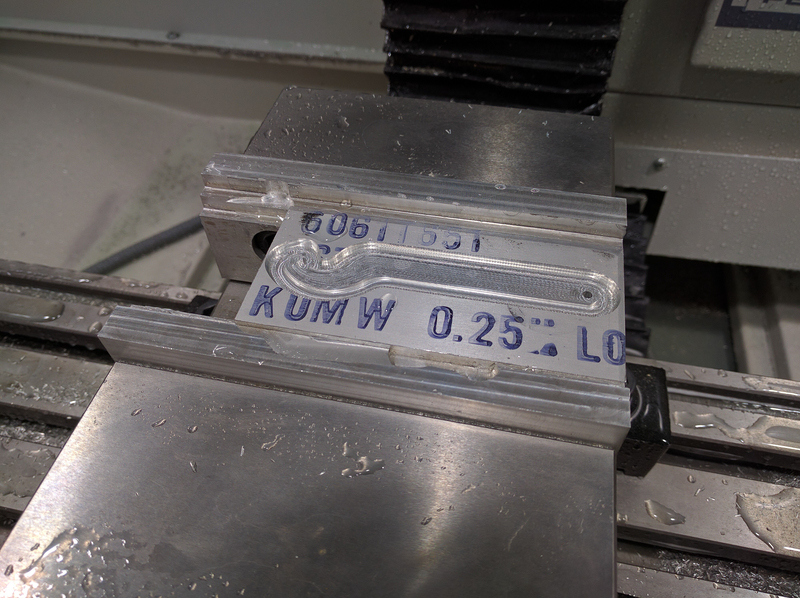 My initial solution was to carry around my end mills together with my calipers, but that quickly became impractical as the number of end mills I had rapidly increased over the last few months. 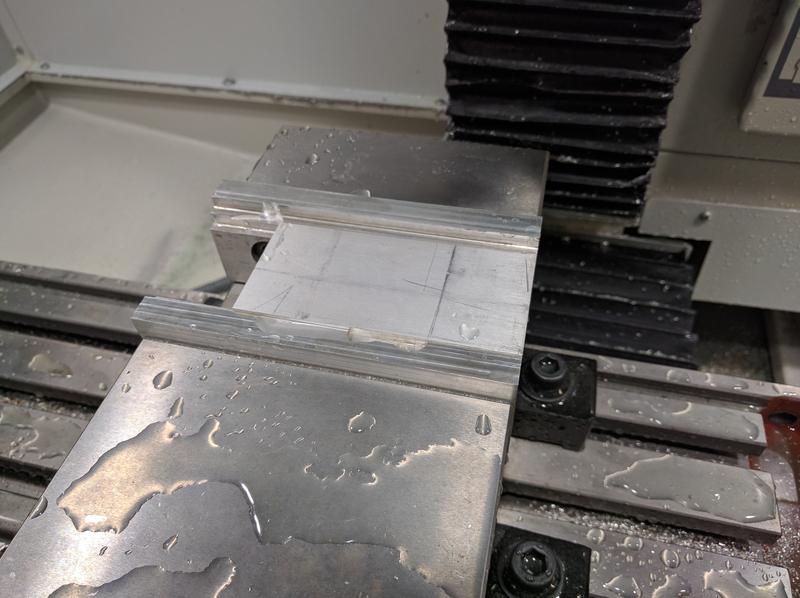 Instead, I ended up making a case capable of holding 22 1/4″ 2.5in length end mills, 8 1/8″ 2in length end mills, and 18 1/8″ 1.5in length end mills. 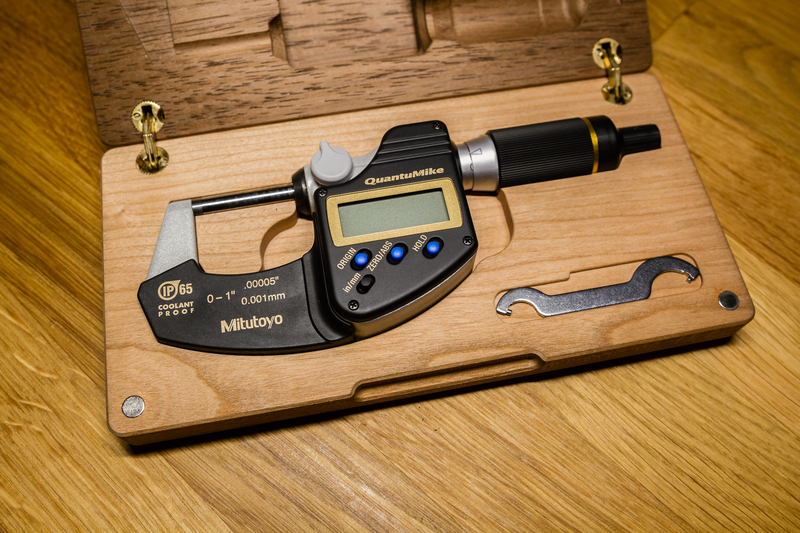 Here’s a fun project I made earlier this year: a replacement case for a Mitutoyo Micrometer as the one that it came with didn’t hold the micrometer very securely. 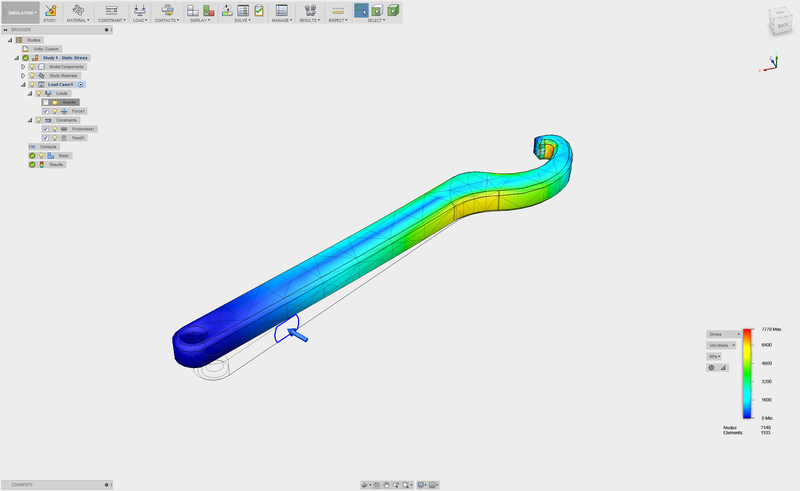 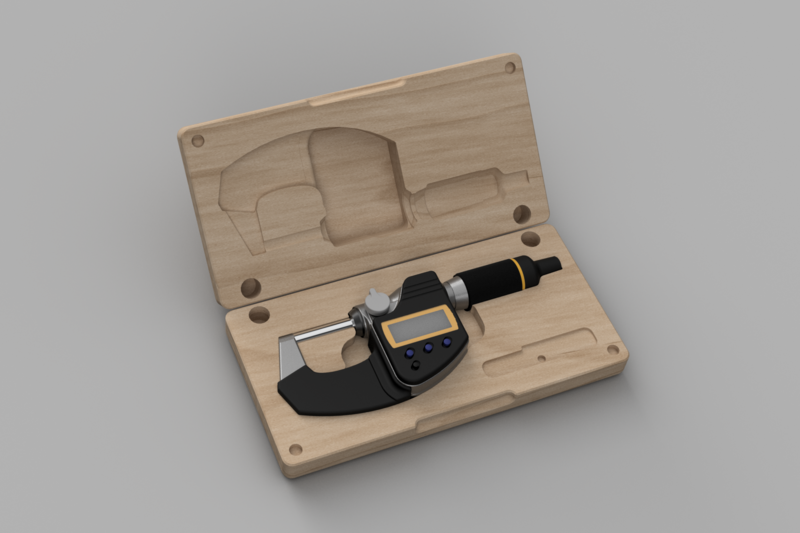 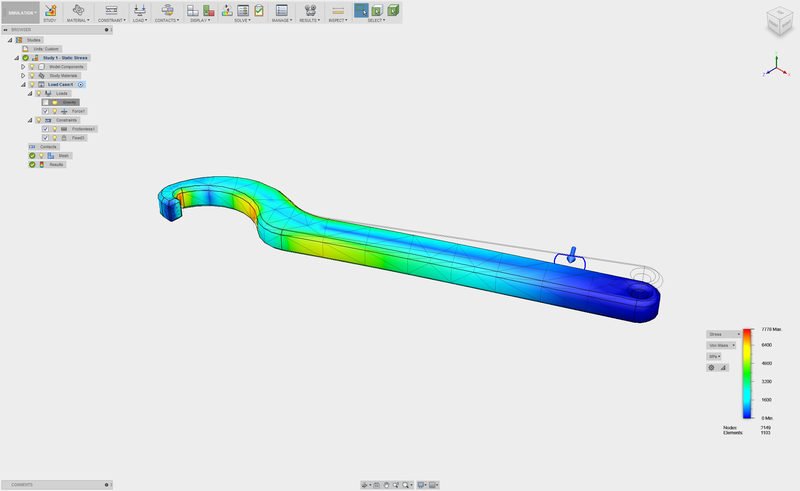 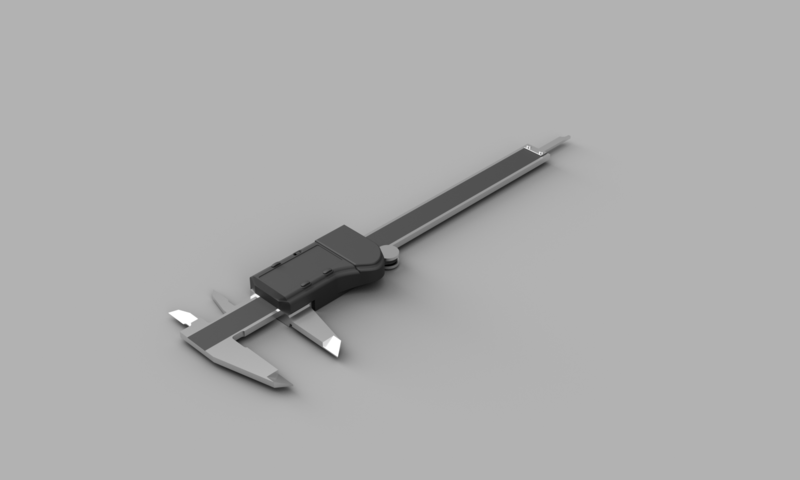 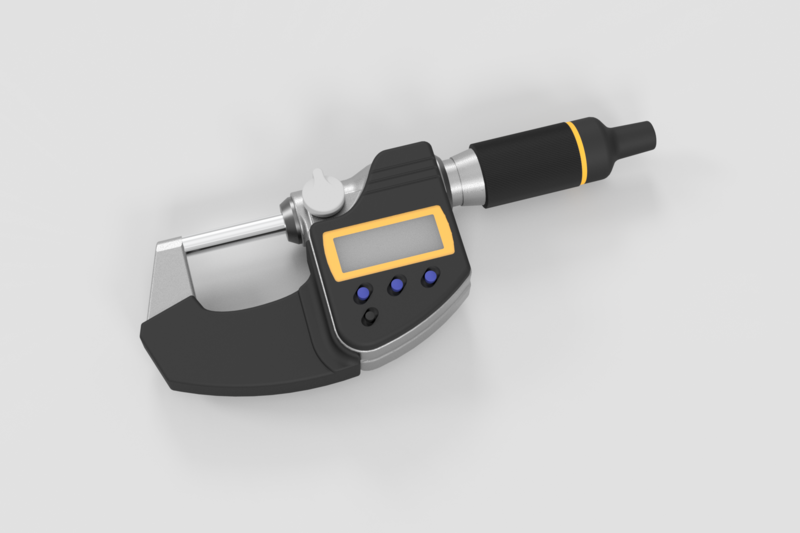 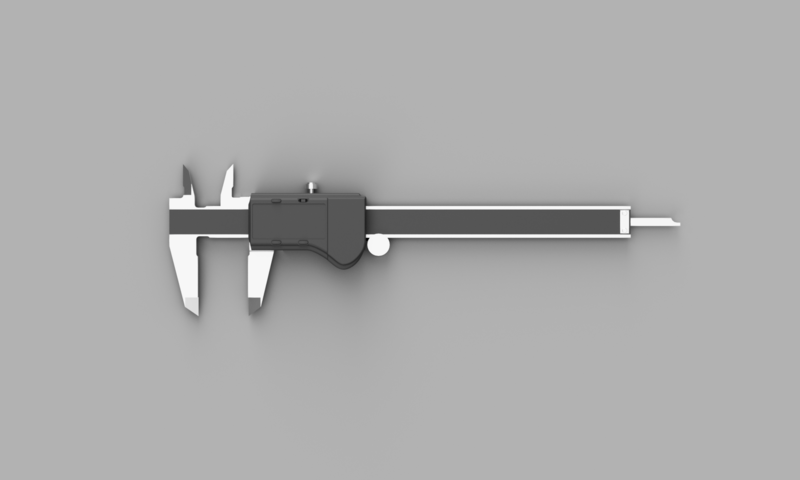 To make a replacement case, I first modeled the micrometer as accurately as possible then did a subtract operation to get the initial model of the case. 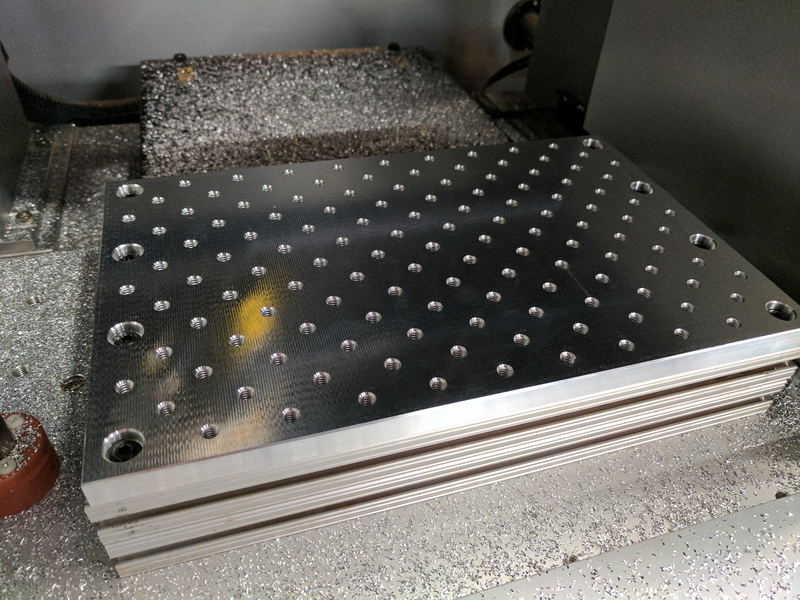 Following that, a bit of cleanup was necessary in order to smooth out the design so that it could be milled out relatively quickly. 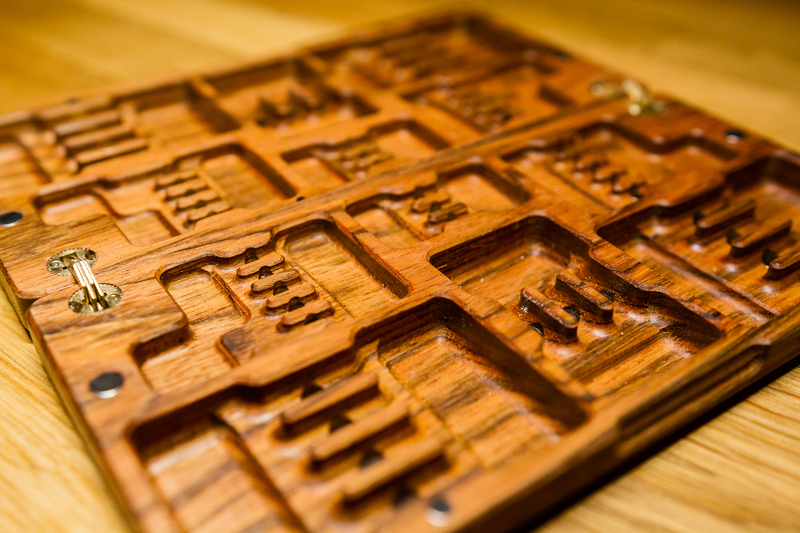 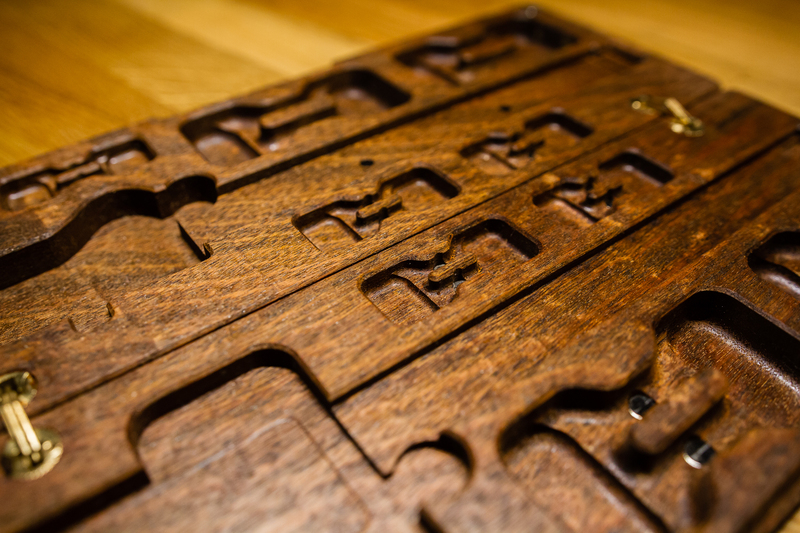 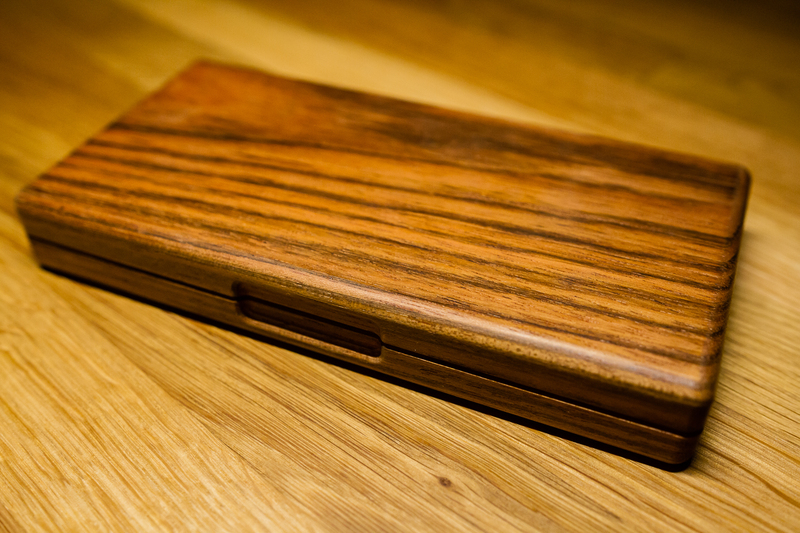 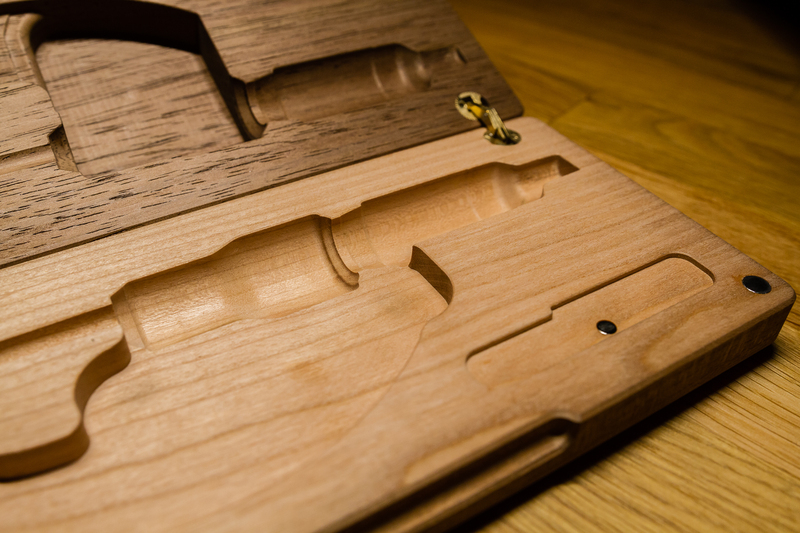 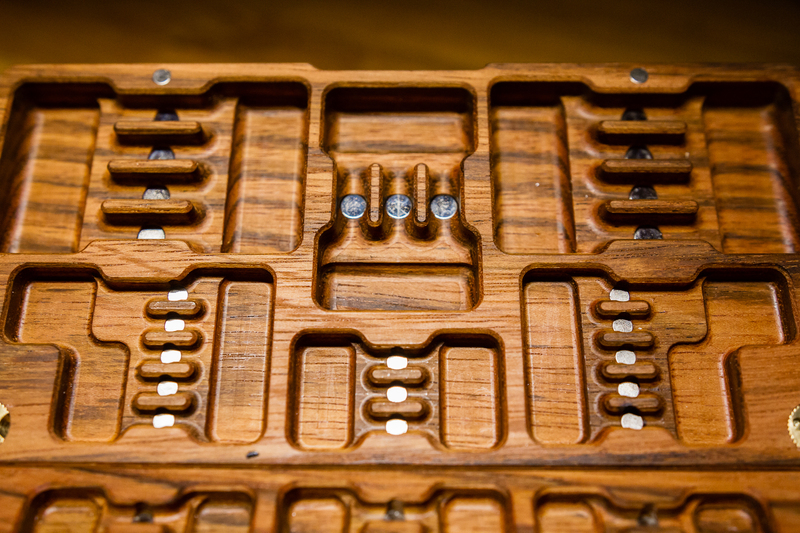 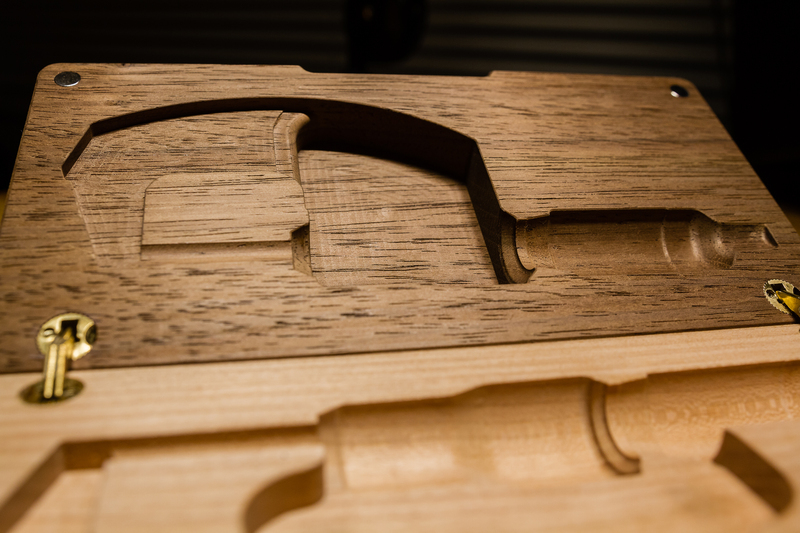 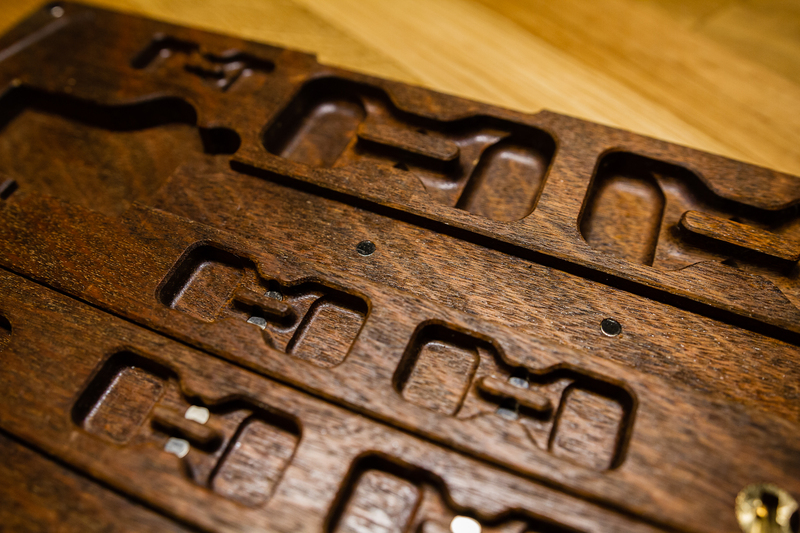 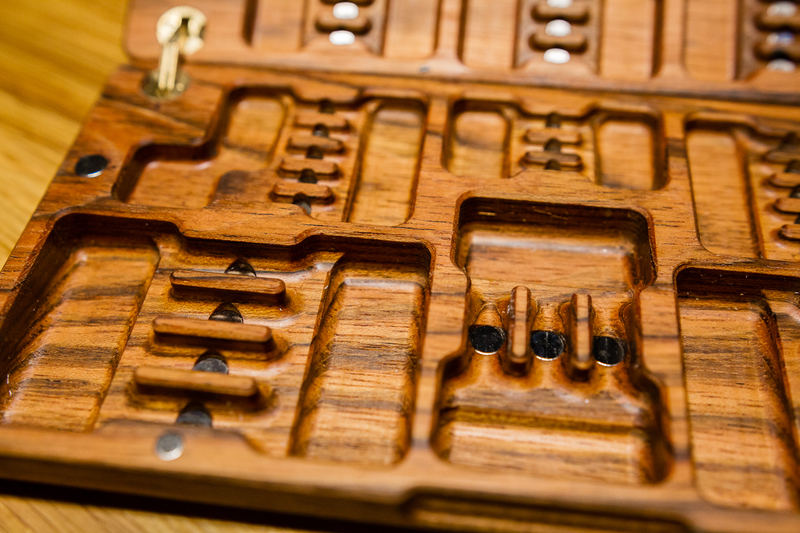 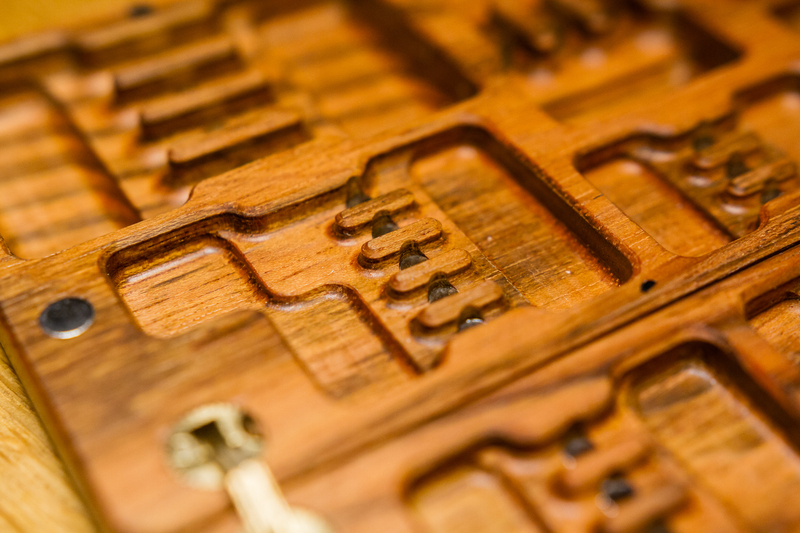 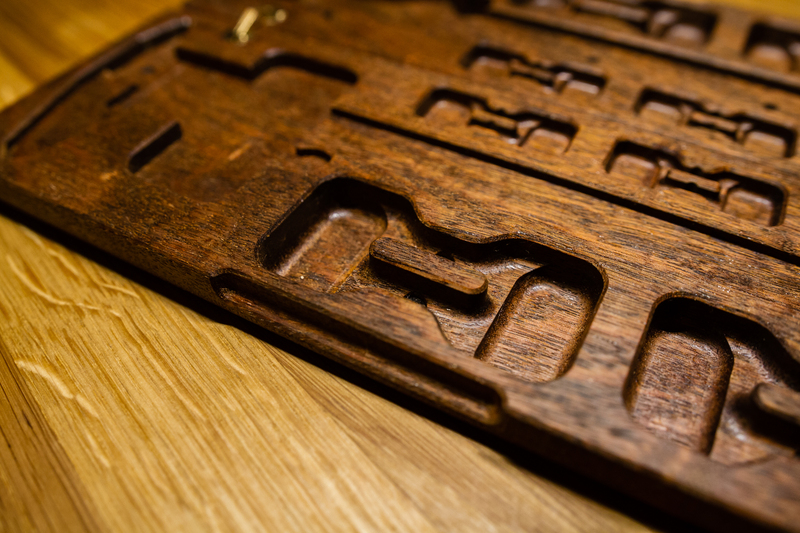 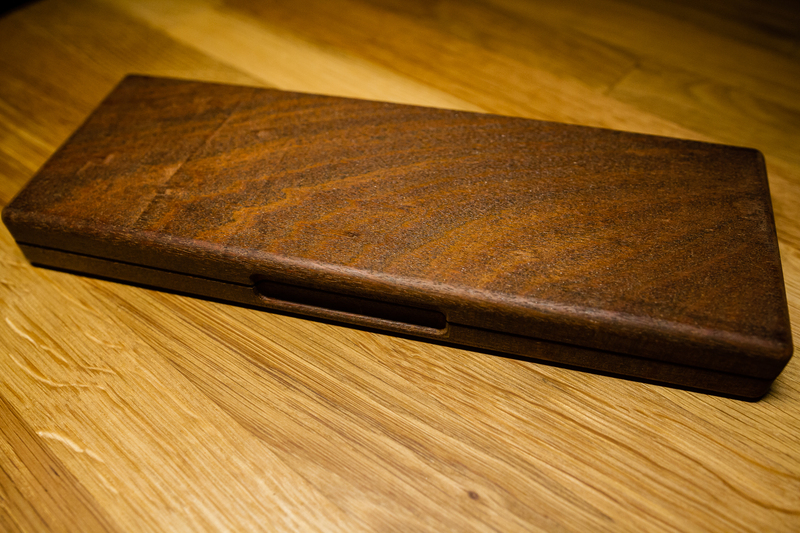 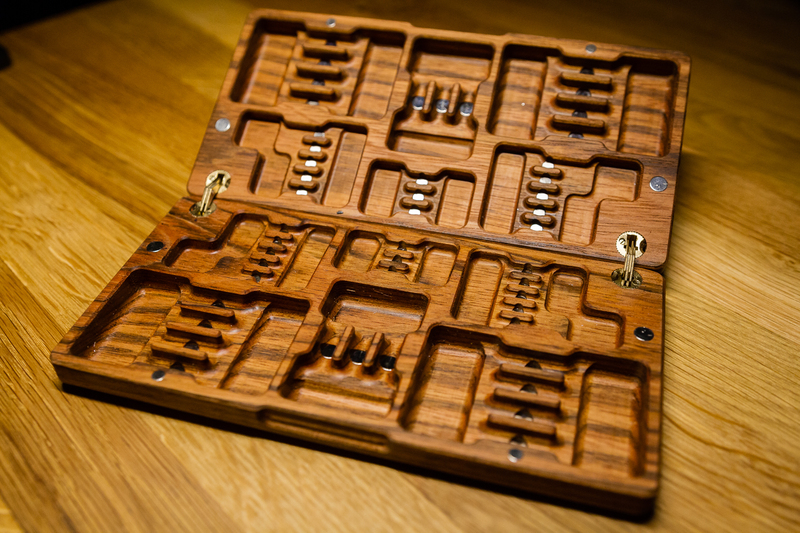 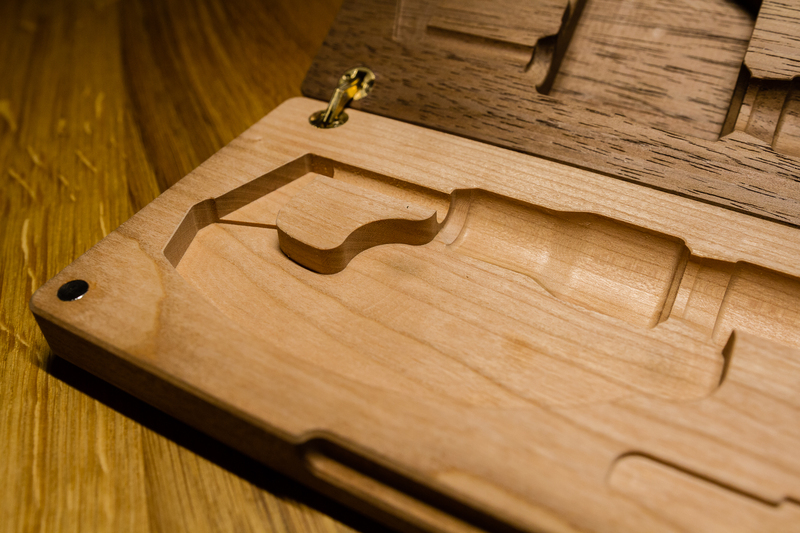 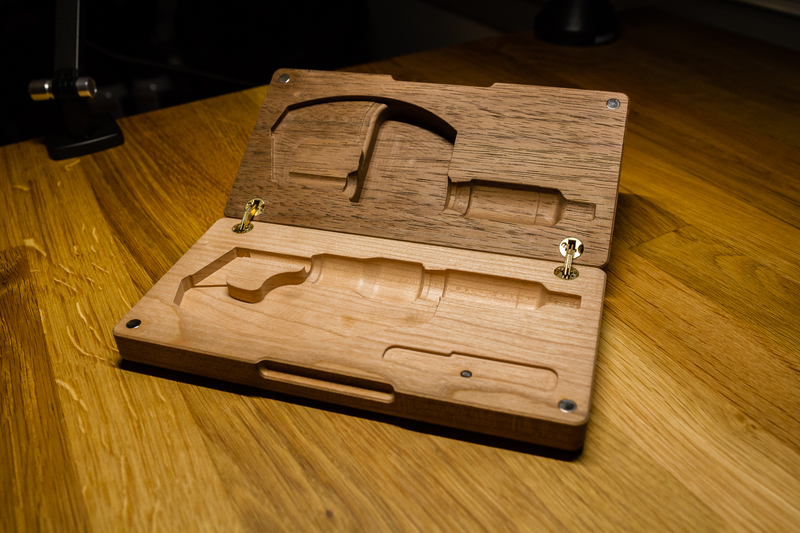 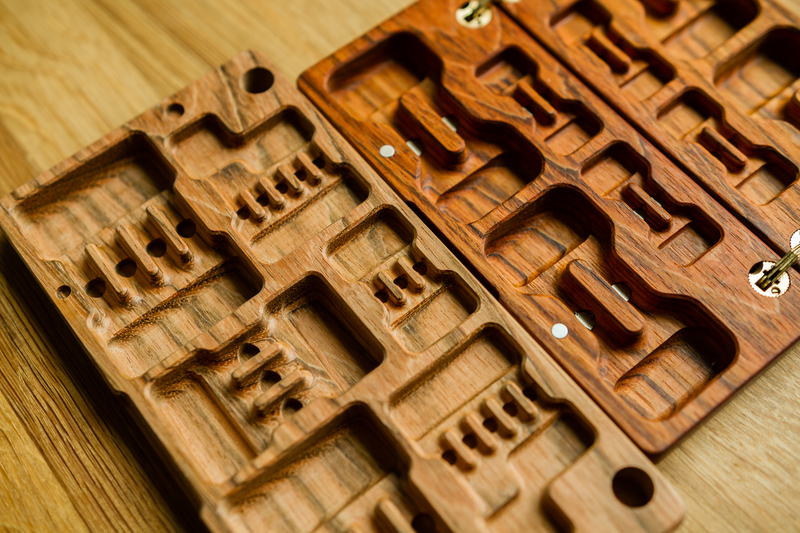 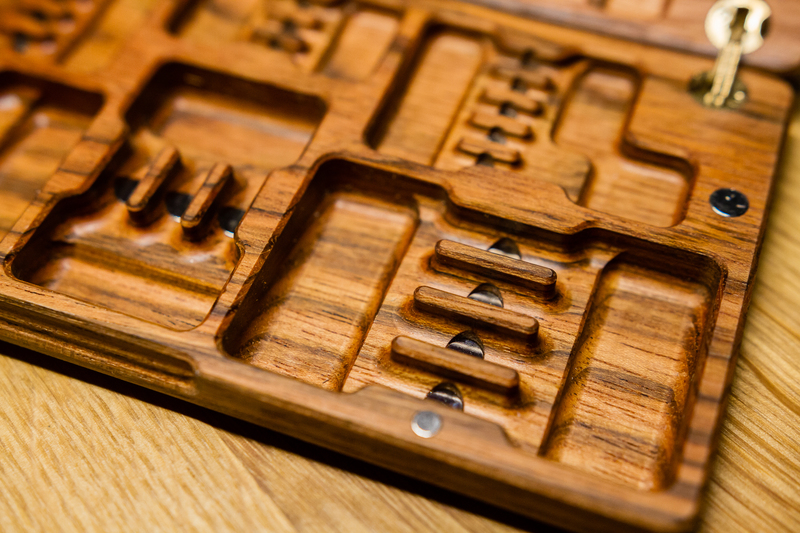 The top half of the case was milled from Peruvian Walnut while the bottom half was milled from Maple. 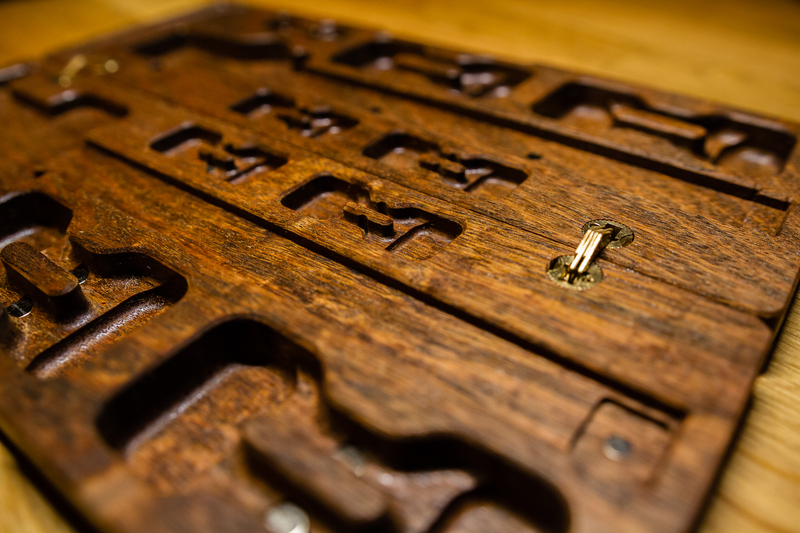 Both sides were left unfinished as I didn’t want any oils or lacquer in contact with the micrometer. 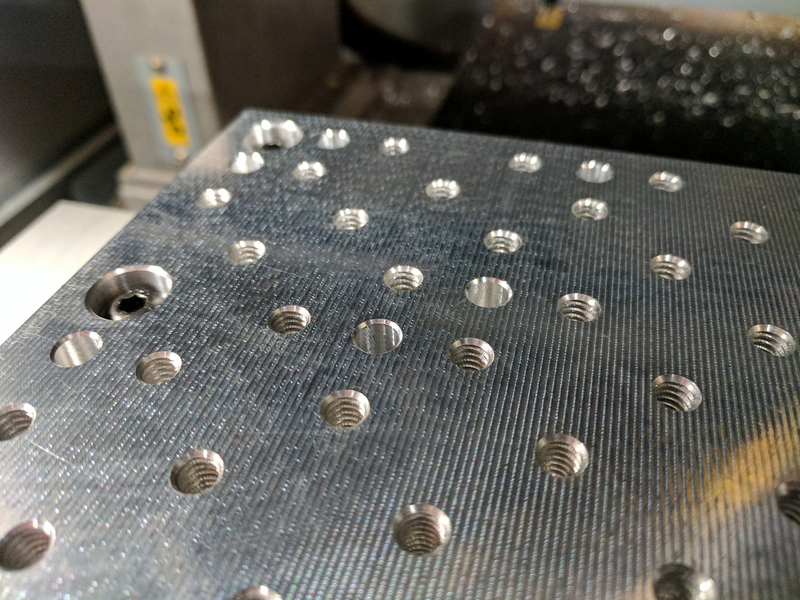 Now that I’ve mostly settled into the life of a working adult, I finally have the time to explore some other stuff that I’ve been meaning to try out. 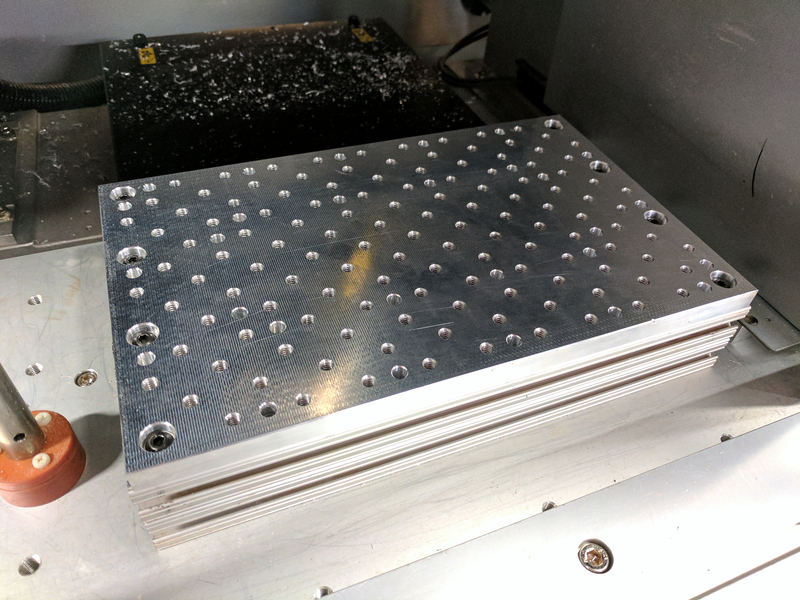 Ever since I’ve moved away from the field of 3D printing, I’ve wanted to try my hand at realizing my ideas and designs using a CNC mill. 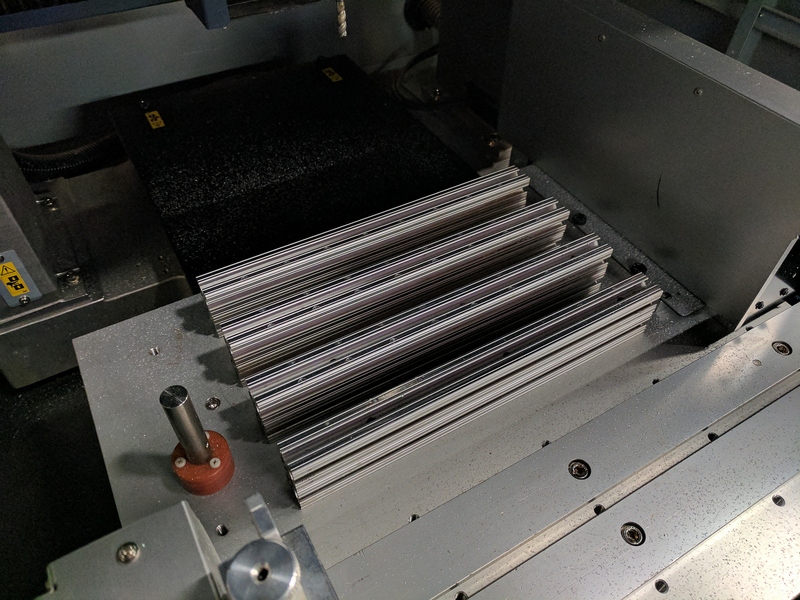 Luckily for me, the hackerspace here at Microsoft has just the machine: a Roland MDX-540. 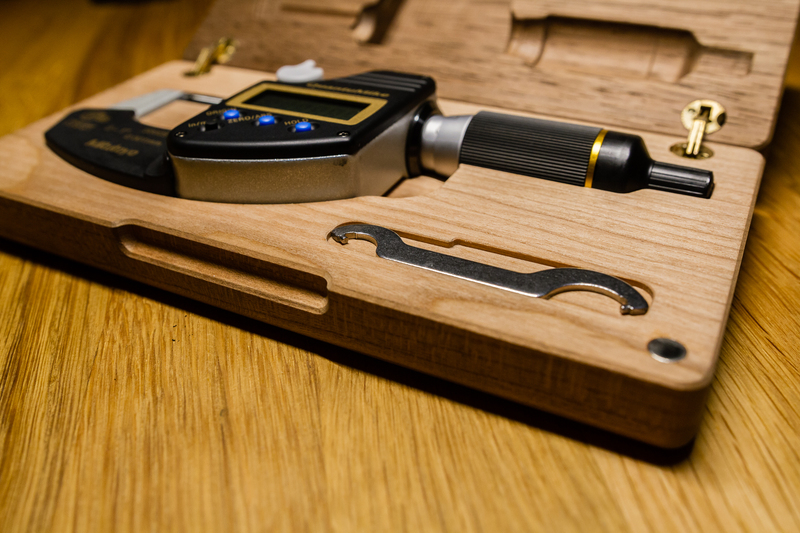 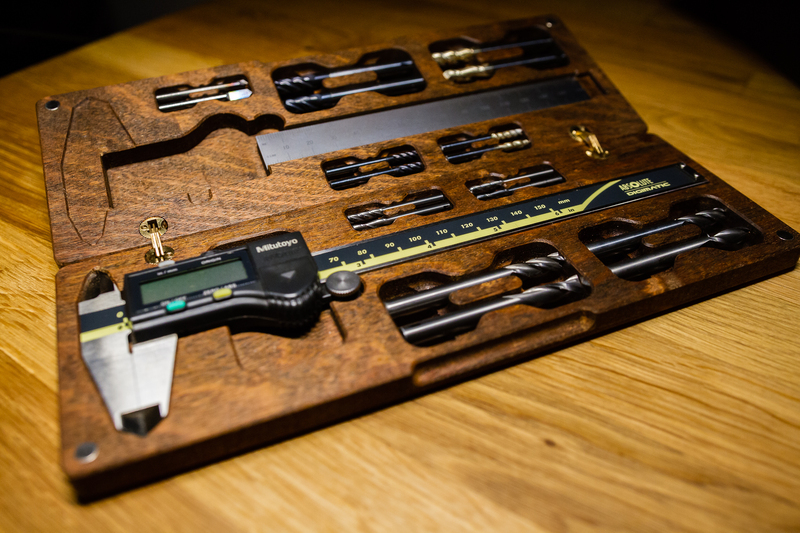 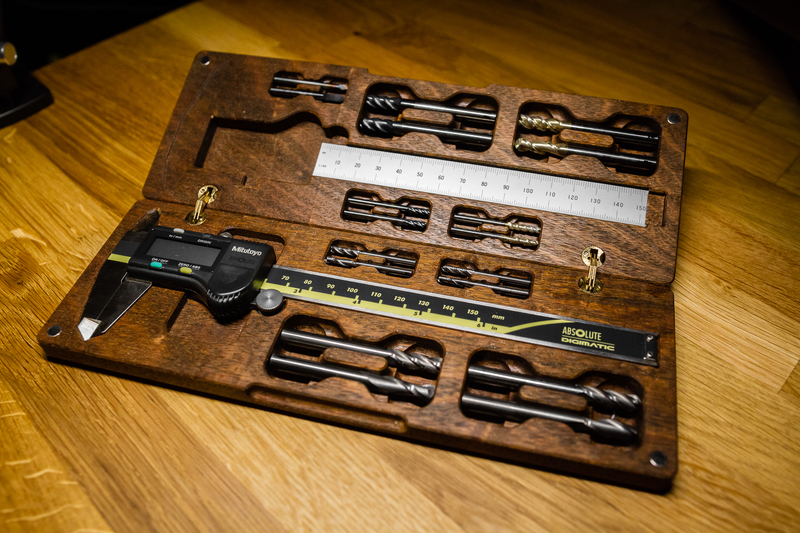 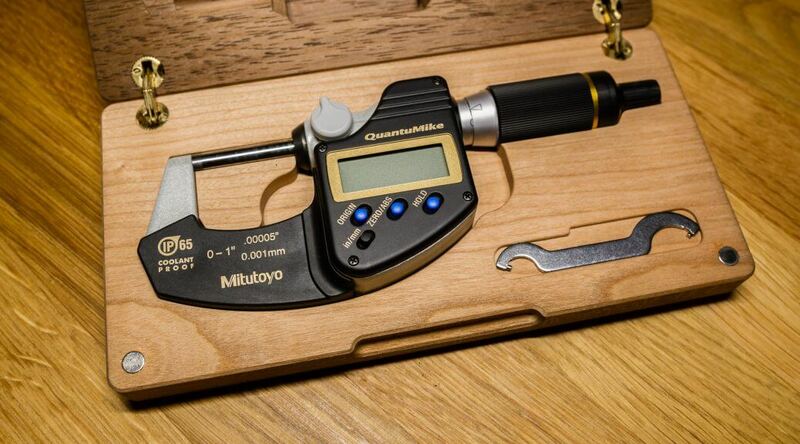 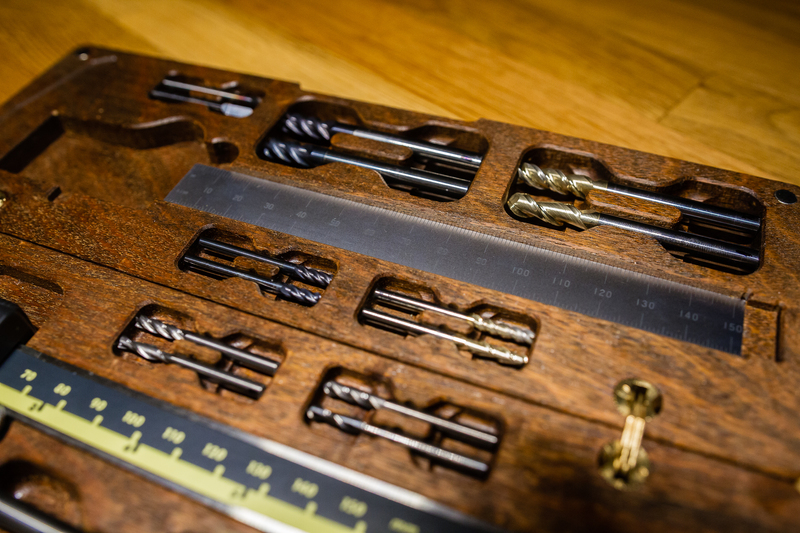 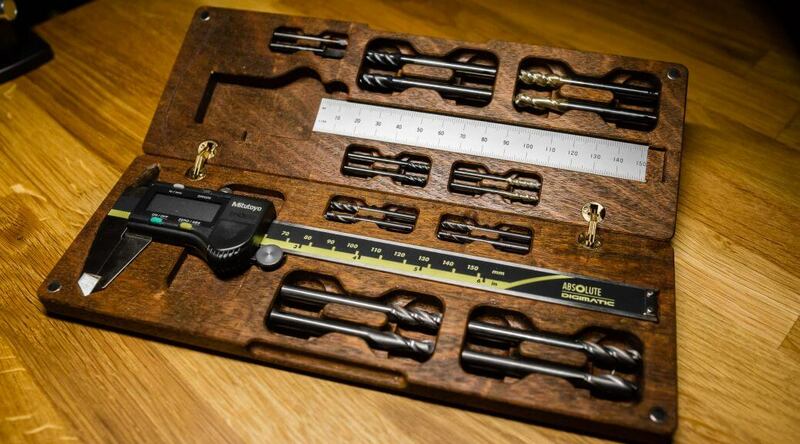 And what is a better starter project than a case for my trusty Mitutoyo caliper?